Items left over from silent auction. lots of other smaller items are still available. Make an offer that we can’t refuse and it will yours. 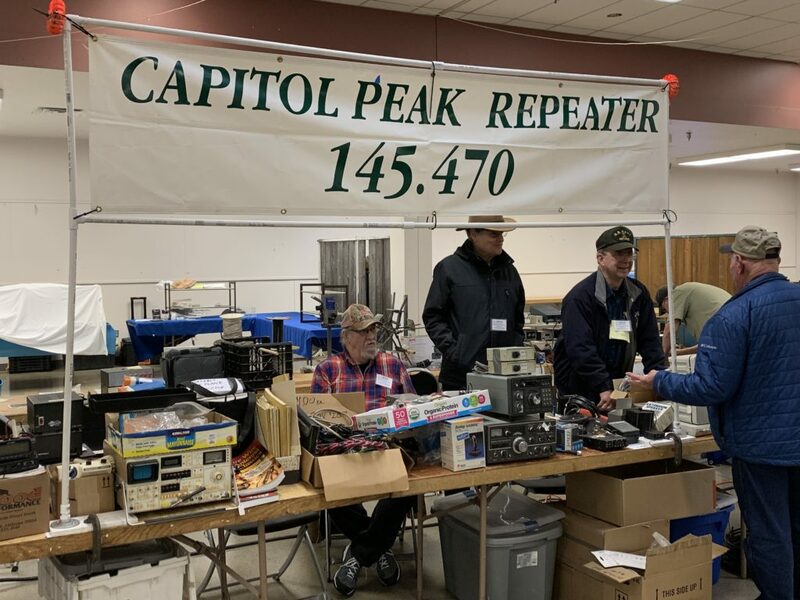 The 2019 Mike & Key swap meet and electronics show was a great success for the Capitol Peak Repeater Group. 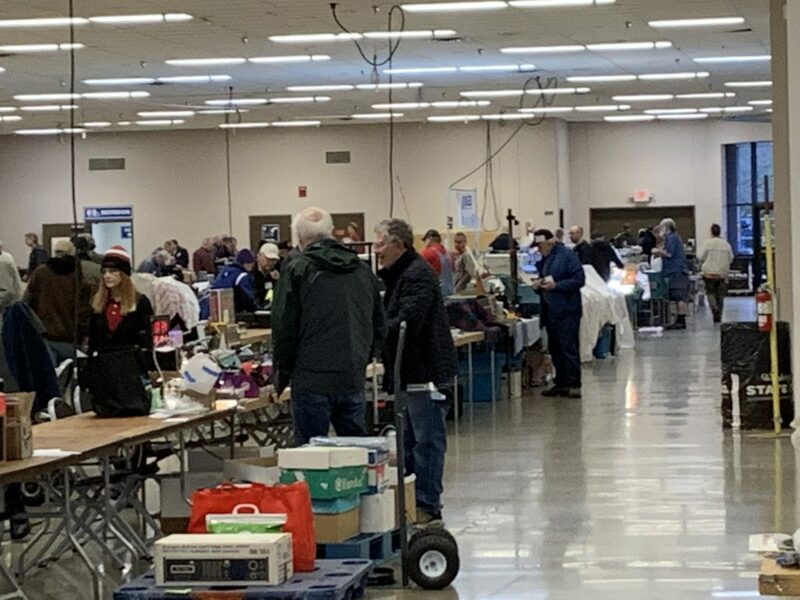 We came away from there with a little over $1900.00 in sales and still have things left over. 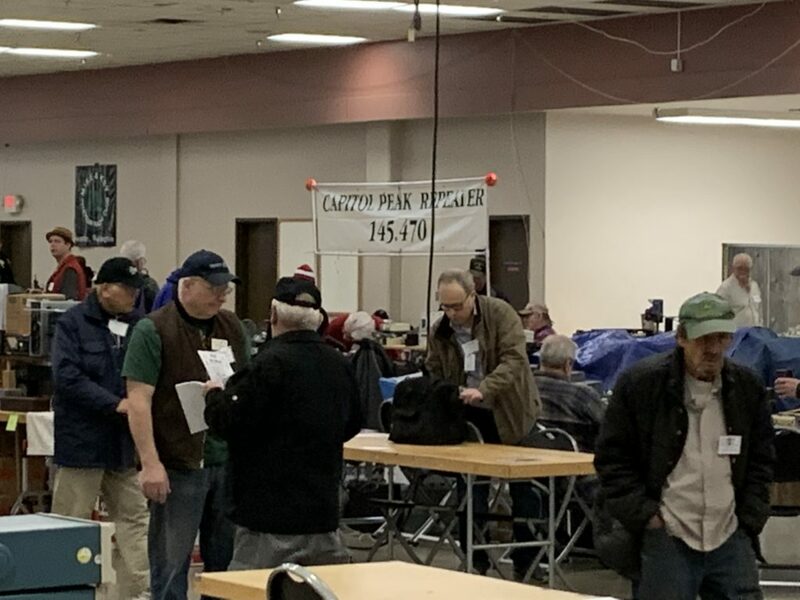 As mentioned in a previous post a few of those items will be available for sale at the annual meeting on March 31, 2019. There will be a silent auction also for a few items. 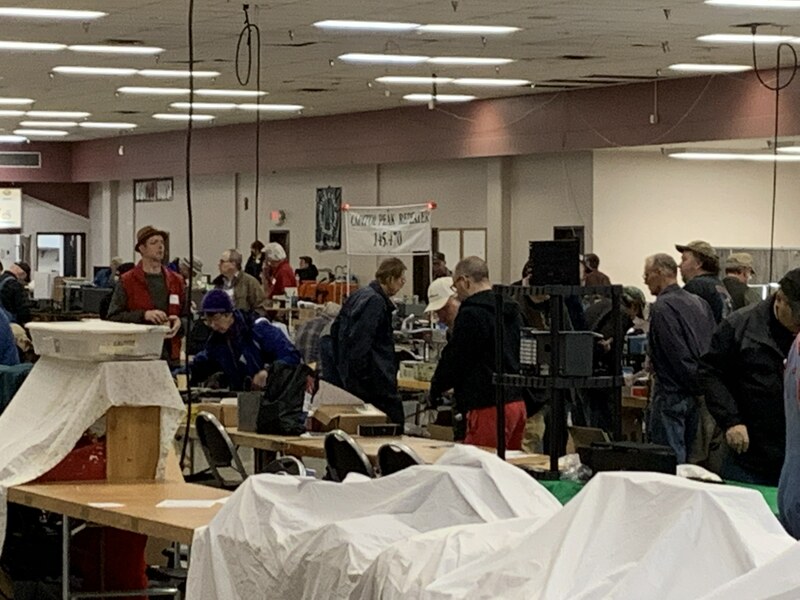 Below are some pictures that Don KD7AVI took during the day of our area at the show. 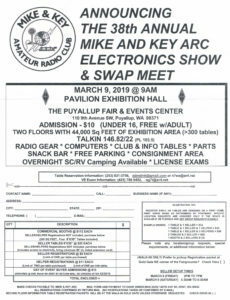 Since not all items sold at the Mike & Key show this past Saturday something new will be tried at the annual meeting on March 31 2019. There will be some items that will be held in a silent auction. Other items will be priced accordingly and will be sold. So bring a few extra dollars to the meeting and go home with some really great stuff. A list will be forthcoming of items for sale. 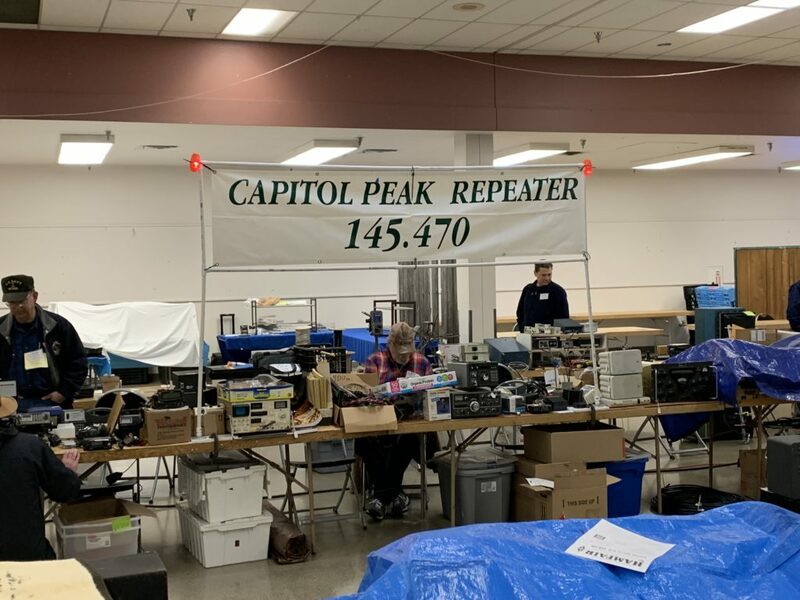 All proceeds go into the maintenance fund for the repeater. 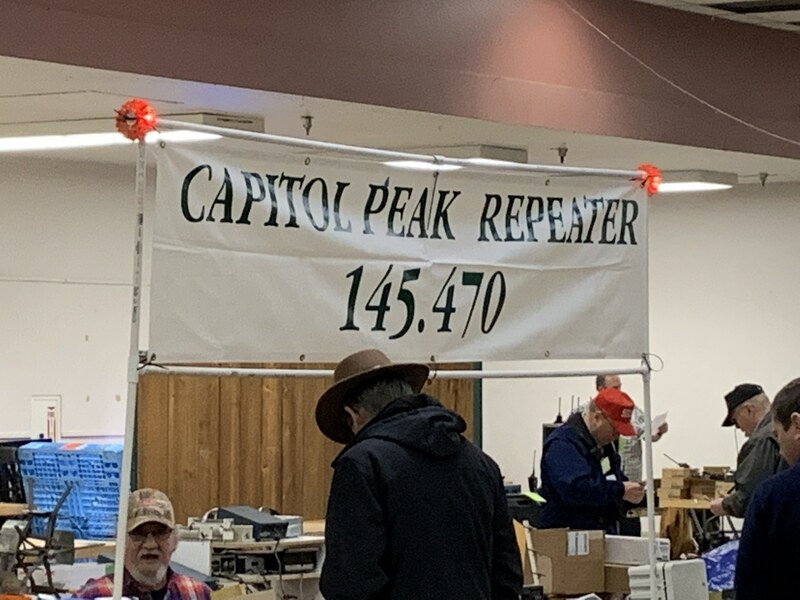 Please plan to attend the RESCHEDULED Capitol Peak Repeater ANNUAL MEETING on Sunday, March 31, 2019. 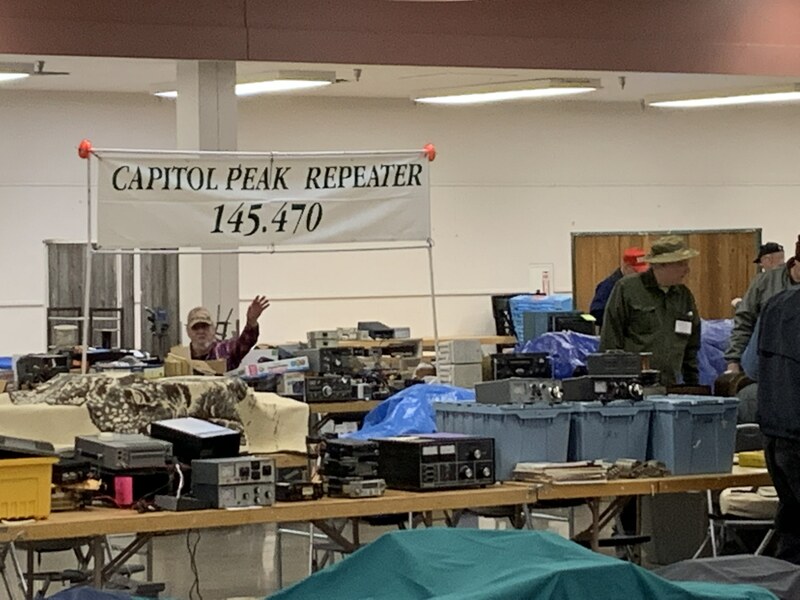 There has been work done on the repeater system like antenna repairs, more wiring clean up and much more. 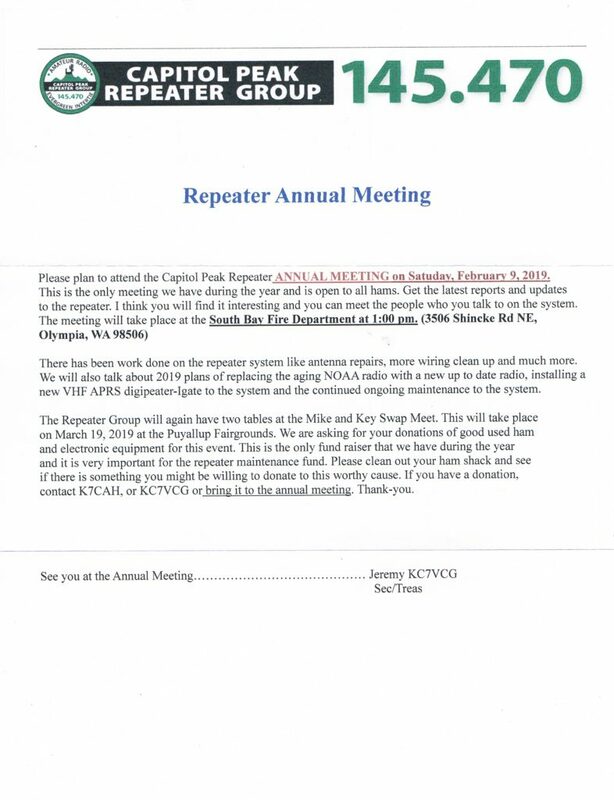 We will also talk about 2019 plans of replacing the aging NOAA radio with a new up to date radio, installing a new VHF APRS digipeater-Igate to the system and the continued ongoing maintenance to the system. 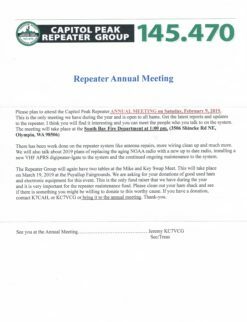 The Repeater Group will again have two tables at the Mike and Key Swap Meet. 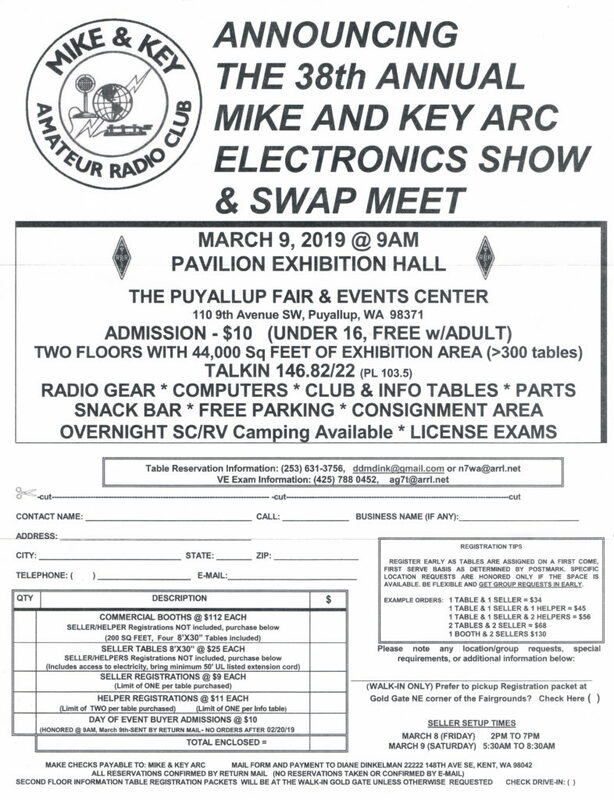 This will take place on March 9, 2019 at the Puyallup Fairgrounds. 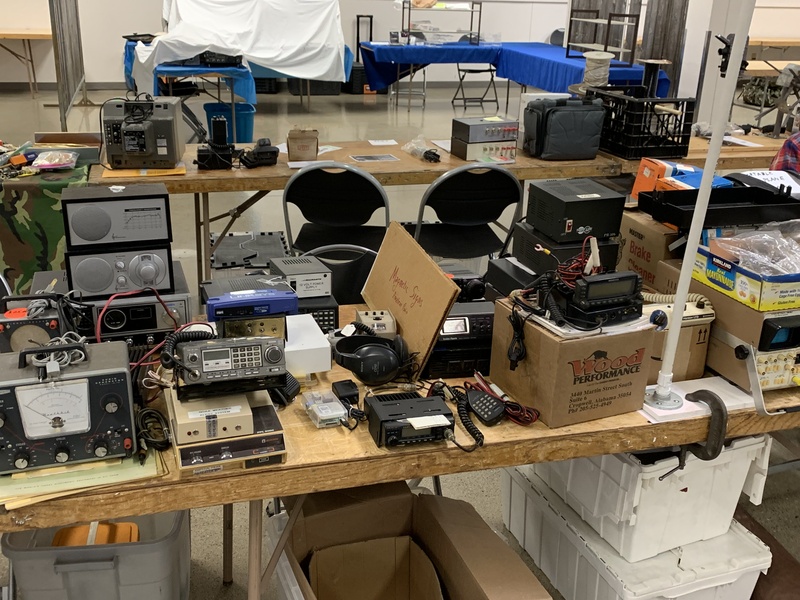 We are asking for your donations of good used ham and electronic equipment for this event. 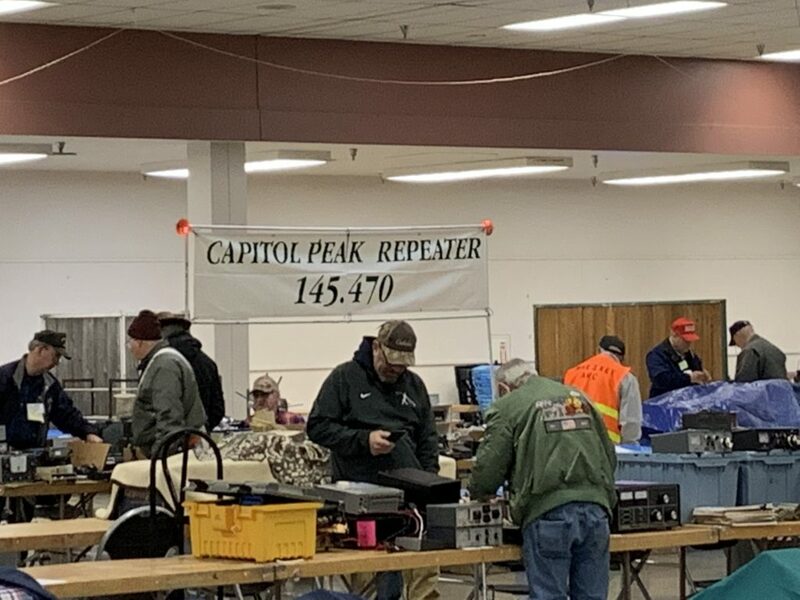 This is the only fund raiser that we have during the year and it is very important for the repeater maintenance fund. 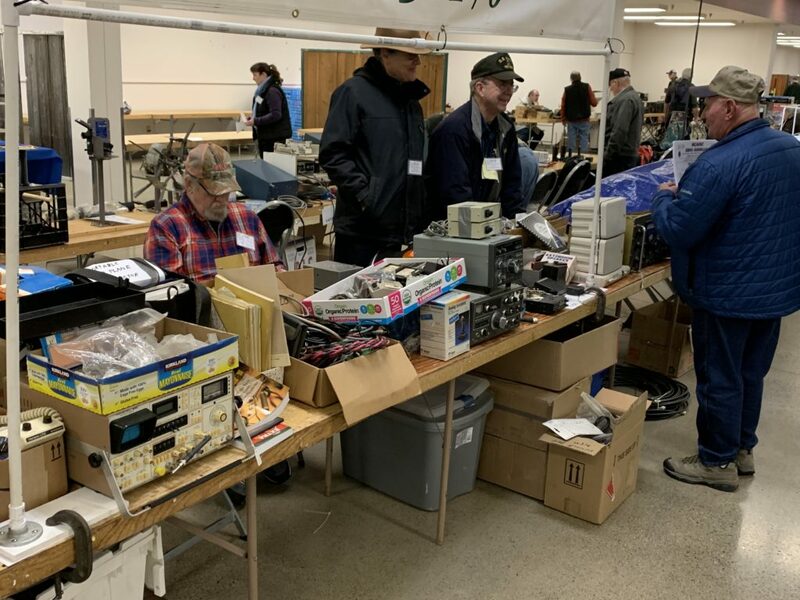 Please clean out your ham shack and see if there is something you might be willing to donate to this worthy cause. If you have a donation, contact K7CAH, or KC7VCG before March 8th and we can arrange to pick up the equipment. Thank-you. The general meeting today (2-9-2018) has been officially canceled for today due to weather. We will reschedule for a different date and make everyone aware vie repeater announcements and a mailing. Please stay safe and don’t be afraid to use the repeater to check in with others or ask for help if needed, that’s what ham radio and the repeater is there for!! We will be making a couple trips up to the repeater to do maintenance on Thursday and Friday the 26th and 27th. Thursday we will be installing cabinet fans and hooking up door alarms, Friday will be doing some antenna work on the tower. If you want to join us and just watch or help contact me Jeremy KC7VCG at Kc7vcg@47repeater.com and we can set up a meeting point to follow us up the hill. Also don’t forget we have our annual picnic on Saturday July 28th at Priest Point park kitchen 3 11AM. This is open to everyone members or non members and is free with door prizes! !